Whether you call it Football or Soccer this is arguably the most popular sport in the world and Microgaming are not the only online pokie developer to bring out a game based around it. This is also one of several sports-themed games from them, and it joins Tennis Star, Rugby Star Cricket Star and others, all of which feature similar gameplay as well, with free spins rounds, random wilds and the Rolling Reels which can lead to several wins from just a single spin. It's also got Microgaming’s popular 243 Ways to Win system, where instead of a number of paylines, players will score a winning combination each time a symbol lands in any position on adjacent reels, running from the left side. Like all the games in this range of sports-themed pokies, Football Star has reasonably realistic images of players, although rather than go to the expense of licensing images of real stars, they have sensibly decided to make up their own. So we see players in colourful strips kicking, diving, heading and scoring, plus a referee, stadium, Football boots and a couple of bonus images that give players some extra-time on the game. A floodlit stadium can be glimpsed behind the reels, while the title is stretched along the top and control buttons run along underneath them. Using these, players are able to set their wagers at anything from 0.50 to 250.00 per spin, with that relatively high minimum bet being a consequence to the Ways to Win layout. Instead of being able to just select a line or two, all of the possible winning combinations are covered automatically, which could stop players who have very limited budgets from trying this one out. An outstanding feature of this pokie are the Rolling Reels, whereby any symbols that are part of a winning combination will vanish, leaving empty spaces for new ones to drop down in to. This can lead to another winning combo being created which repeats the process, so players could get several wins out of one spin. Bonuses in this game come from landing wild and scatter symbols in the right places. The wild is the Football Star logo and only appears on reels 3, 4 and 5, but makes up for this by being stacked on them, which opens up the possibility for some decent wins, or even several winning lines being completed at once. There’s also a randomly triggered Striking Wild feature where a player kicks a ball at the reels and one that’s hit will turn fully wild. The rest of the reels will then spin as many times as needed until a win occurs. The other main feature is a free spins round that kicks off when the Football scatter symbol stops in at least 3 positions following a spin. 3, 4 or 5 of them are the key to unlock 15, 20 or 25 spins, during which the Rolling Reels multiplier system, which is another Microgaming speciality, will be in effect. Each win in the free spins round will feature Rolling Reels as in the base game, but a bigger multiplier will be awarded for every consecutive time it happens. Potentially, this can go all the way up to a 10x multiplier, but it would have to be a pretty lucky player who got that many wins one after the other. On top of any prizes from the free spins, scatter wins are also awarded, with the payouts being multiples of the total amount staked on a spin, rather than the coins per line for other prizes. An Open Goal or Trickier than the Off-side Rule? Football Star may have very similar payouts and bonuses to other Microgaming sports-related pokies, but that’s really not a bad thing. The 243 Ways to Win system is perfectly good for those who are happy wagering 0.50 as a minimum, while the extra features have the potential to be quite rewarding. Rolling Reels in particular are a welcome addition to this game, as even without the multipliers of the free spins game, players can still get extra wins for no extra wagers, and the random Striking Wild is another guaranteed winning feature that’s welcome on the team. Downsides? 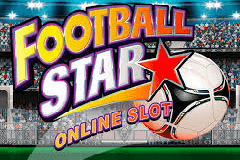 Well, many Microgaming pokies have a gamble round that can multiply wins over and over, (or lose them), and maybe this could have been added here, but apart from this, Football Star is a pretty good all-rounder.